Alex’s Summary: Marie Lu has the two characters, June and Day, working alongside each other to rescue his captured brother. Just a while back his mother had just been killed by the Republic as a way to capture him. This was before June would decide to go on Day’s side. With Day captured June thinks everything is done yet the truth behind the Republic begins to unravel and she goes against everything to join Day’s side. Now traveling in Las Vegas on the run, they will join the Patriot rebels and attempt to save Day’s brother and reunite the country that once was. But the unthinkable happens, the Elector Primo dies and his successor will spell disaster if nothing is done to suppress the chaos that follows. With a compelling story just like its predecessor, Prodigy will immerse you into a story that is filled with mystery, suspense, thrills, and love. 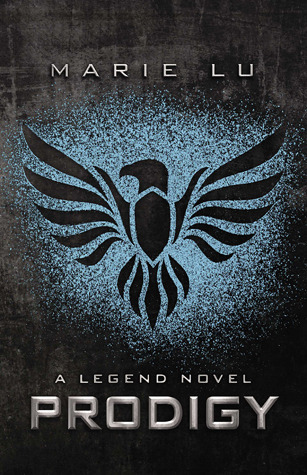 Alex’s Review: After reading Legend, the open ending at the end of the book just compelled me to want to read the sequel. I wanted all the questions to be answered, what would happen after everything that has happened? Who would die and who would live? The questions just kept coming but because of all those questions, I congratulate Marie Lu. She has written a story so compelling that you won’t want to put it down. Everything about it just makes the book readable. I love the way she uses the questions that readers might possess at that time and answer them in a variety of ways. Ways that may surprise the reader. The way the events play out is easy to follow and I was left with little questions about why this happened or why this character did this. There is nothing I can say about the book and Marie Lu that I would have changed. It’s just that good. It keeps you on your heels, holding a mystery around every corner and the suspense forces you to keep going. The 3rd and final book of this series, Champion, will have me itching for what Marie Lu has in store for the epic finale. I would love to see a country unified now into one country. I would love to see her continue using the format she’s been using to keep me reading the books and always wanting more. I want the ending to be something worth remembering as the series comes to an epic closing.